The resistivity of silicon plays an important role in power semiconductor devices. 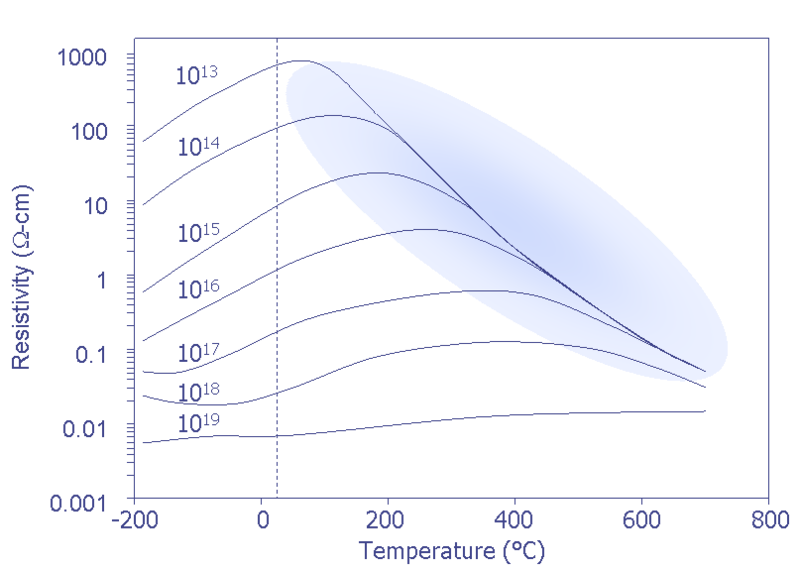 This graph plots n-type silicon resistivity as a function of temperature for several different doping concentrations. Notice that as the doping concentration increases, the resistivity decreases. Also notice that for lower doping concentrations, the resistivity initially increases with temperature, but then decreases as the temperature goes higher. The higher temperature regimes can lead to a negative thermal feedback condition. As the temperature gets hotter, the resistance drops, allowing even more current to flow. This situation can lead to current crowding, and eventually melting of the silicon. This is a concern because a low doping concentration is required to stand off high voltages. Therefore, it is important to design the silicon device and its packaging such that this does not occur. In order to keep a power semiconductor device from operating in this region, one must design the heat sink such that the thermal energy is pulled away, preventing the device from reaching the negative thermal feedback regime. Give our Online Training a try – for free. This month's topic is Time Resolved Emission. Time Resolved Emission is emerging as the best technique for obtaining waveform information from advanced integrated circuits during debug and failure analysis. Semitracks offers the most comprehensive course on Failure and Yield Analysis on the market. We have updated this popular short course substantially over the past year. The course includes our 800-page manual and CD-ROM. This year, we are offering the course at the Hilton, Singapore.